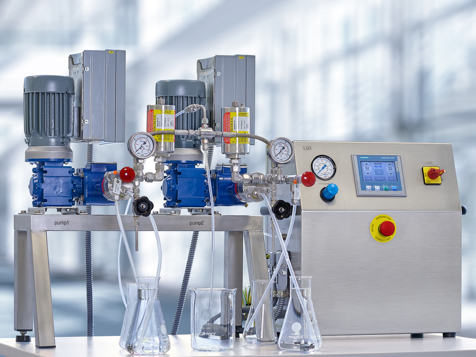 The MJR® reactor enables chemical and physical syntheses for the continuous flow production of nanoparticles and microparticles, emulsions and encapsulations. MJR®-based products are precisely defined in size and superior in quality. 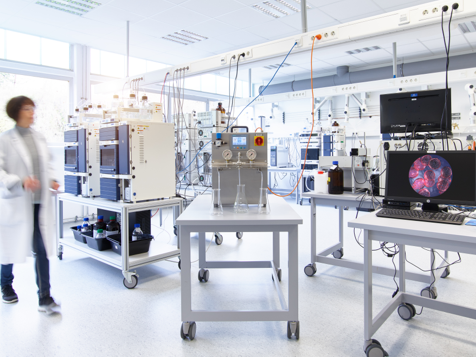 State-of-the-art nanoparticle manufacturing (such as in colloidal mills) involves a top-down process, where nanoparticles are made from large-particle powders through mechanical force. 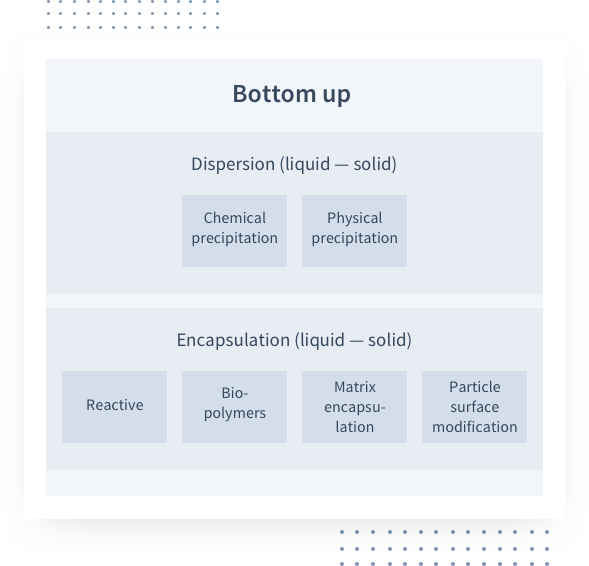 In contrast, our MJR® Technology uses a bottom-up process in which nanoparticles and microparticles (< 1 µm) are produced from dissolved molecules by means of precipitation. The 3 cm-long reactor has four openings and contains a central mixing chamber where the synthesis occurs. The two fluid reactants are injected into the chamber from the left and from the right, as jet streams. These streams are accelerated to velocities of up to 300 meters per second when flowing through the nozzles, resulting in a high level of kinetic energy. The collision of the jet streams in the mixing chamber leads to highly turbulent processes whereby the reactants are completely mixed in less than 1 millisecond. The high kinetic energy of this mixing process creates a very homogeneous product with a high yield. 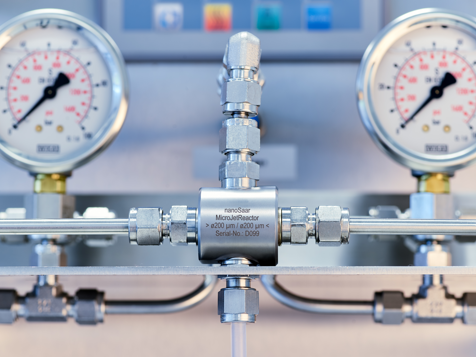 A carrier gas (inert or reactive) flows in from above to regulate the continuous mixing process and swiftly remove the product from the mixing chamber. 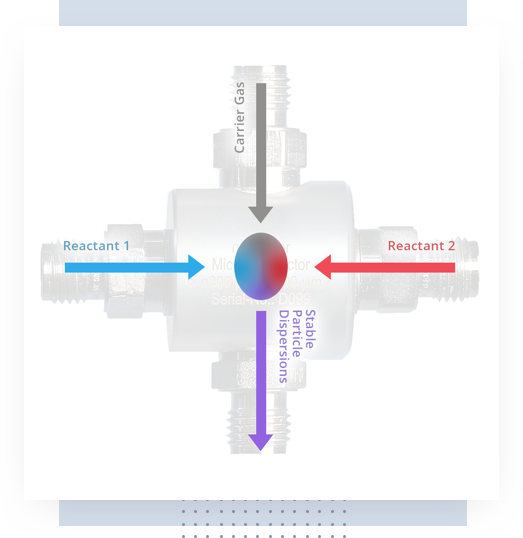 The product flows out through the reactor’s outlet in quantities of up to 600 liters per hour. Lower process costs—as compared to shear force-driven conventional technologies—result in significant economic advantages. Purely physical or chemical kinetic MJR® processes give rise to very homogeneous emulsions, precipitations and encapsulations. 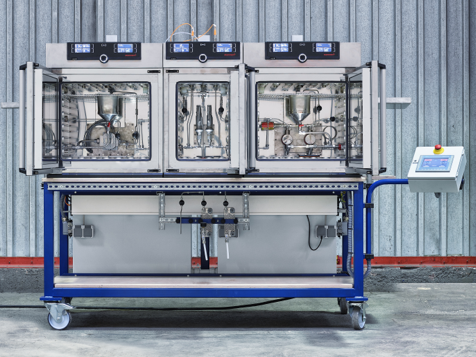 Depending on the number of MJR® heads used, the output is a multiple of 600 liters per hour. The application of carrier gas prevents the chamber from clogging—which enables a 24/7 automated production process. 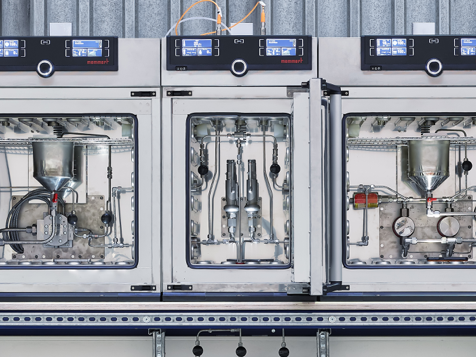 Direct transfer of development results to production-sized scale through identical reactor dimensions for laboratory and industrial production purposes—which means shorter times to market and greater returns on investment. 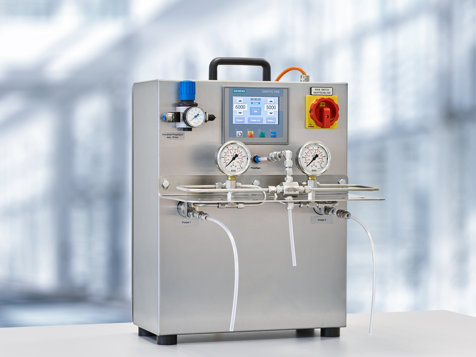 The size of a suitcase, our LK1 small-scale lab device enables accurate liquid pumping for outputs of up to 30 liters per hour. 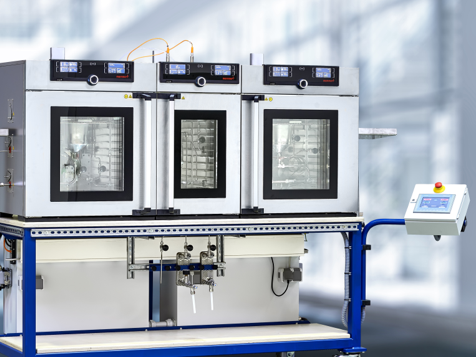 This versatile unit is typically used for precipitation, emulsification and encapsulation tasks in the initial R&D phase. It features micro gear pumps with high-precision flow rates, MJR® reactors with nozzle sizes ranging from 50 to 1500 µm, inlets for inert or reactive gases, and a software-controlled environment. It is ideally suited to chemical processes requiring stoichiometric volume streams and hydrodynamic pressures of up to 40 bar. Our LG1 medium-scale lab device enables liquid pumping even when the liquids demonstrate abrasive pigment-based behavior. The LG1 has a maximum output of 60 liters per hour and is typically used for chemical and physical processes requiring robust volume streams and hydrodynamic pressures of up to 100 bar. 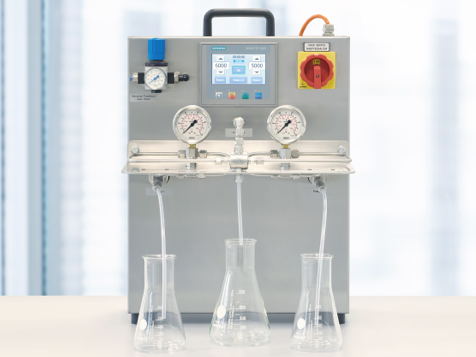 This unit is often used in the phase between producing lab- and pilot-scale quantities. 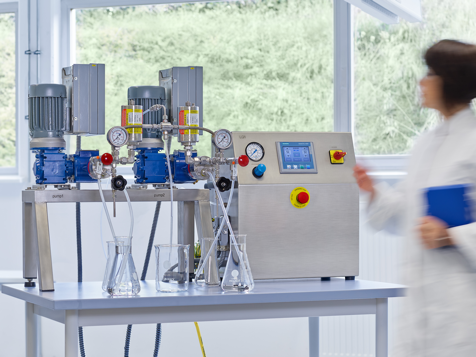 Our LGHT large-scale lab device was designed for R&D high-pressure applications. It generates hydrodynamic pressure of up to 210 bar. 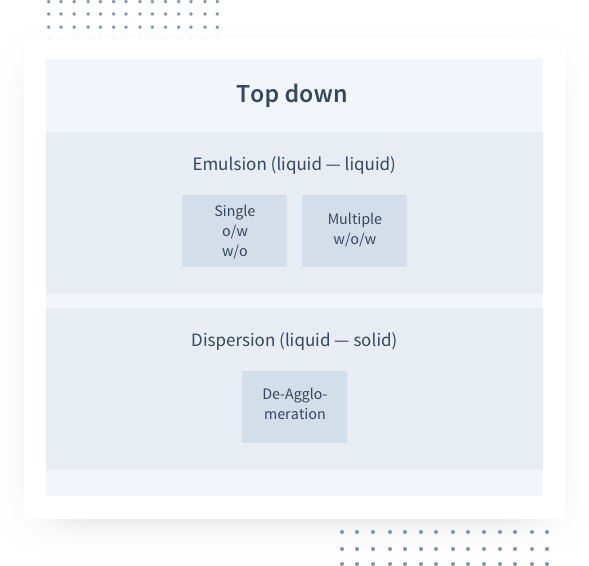 This, in turn, triggers higher acceleration rates (higher kinetic energy) in the process fluids and increased turbulence during mixing, precipitation or emulsification. The LGHT allows liquid pumping to occur under a homogeneous thermal control of up to 250 °C, with a maximum output of 80 liters per hour. It is typically used for thermally supported chemical processes, melting processes, matrix encapsulation and emulsification.